We just got back from a trip to Mexico, and I can’t tell you how much I value my time spent there. Beyond margaritas and fish tacos and poolside amenities, there was rest and a lot of time- quality time with my husband. Somewhere between the nine to five and the raising two kids and the daily checklist of things to do, I have forgotten how to laugh. I’ve forgotten how to joke. I’ve forgotten how to play and how to flirt and how to make lazy conversation with my husband. In Mexico, there wasn’t any business talk. No work stress. No employees calling in sick, or check lists, or babies with a belly ache or needing more milk or one more bedtime story. There was me and my husband and the words and the air that flowed in between us. That’s all. To be clear, I understand that this is not always real life. Real life contains joy and happiness and series of perfectly mundane moments, but real life is also work. Real life can be hard and busy and full. And when life gets like that, the last thing I remember to do is to act in love. It can become challenging to remember all the reasons why you decided to do life with someone. We didn’t need Mexico or sunshine or spa appointments or mint flecked, frozen beverages, but we needed vacation. We needed quiet time to connect and to be ourselves- the people we were when we chose each other. The people who aren’t covered up in work stuff or baby drool or mounds of tasks to check off our lists. To my mother-in-law who kept our babies while we were gone: thank you. You sewed into our marriage. Your time made us better. And to those of you who are in desperate need of something new: find it. Take time off. Take a trip or a drive or just fifteen minutes before the day ends to love the person you’re with. Fight for the things that are important to you and invest in the things that give you life. My friend Susan Goodman wrote an incredible book called “Pursue Possibilities”. 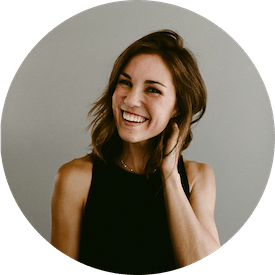 In it, she talks about forming habits and she poignantly says that whatever you want your life to look like in ten years has to start today. If you want to be a CEO of your company in ten years, you have to act like a CEO today. If you want to author a book in ten years, you have to write today. If you want to be holding your husband’s hand in ten years, you need to hold his hand in the gritty now. In ten years, I want to be holding my husband’s hand. In ten years, I want to be sitting at the dinner table with my family and know that the decisions I made ten years ago made my present life that much sweeter. But I need reminders to participate in the now. To actively partake in the moments that make our marriage sweet today. So reader, I beg you to remind me of this daily. Hold me accountable. And as your friend, I promise to do the same. And if you are currently reading this saying to yourself, “Sheesh, I wish she would hurry up and talk about some ice cream,” OK! Here it comes! 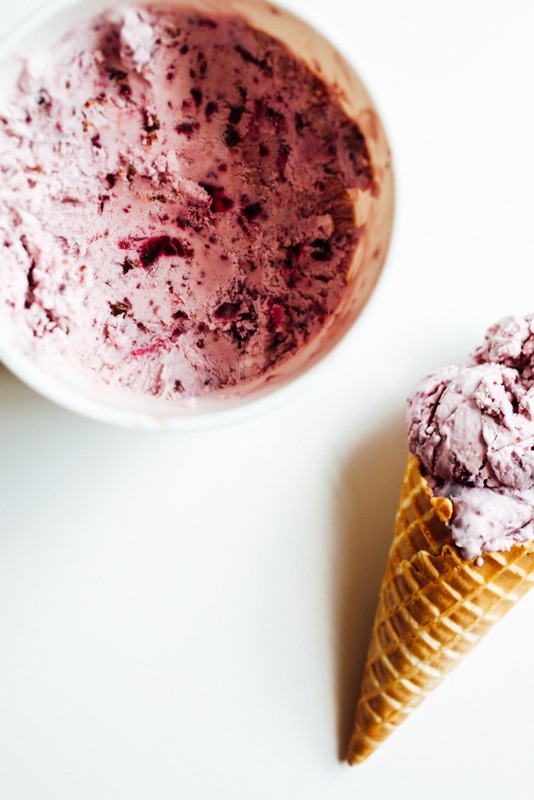 I decided to make this no churn cherry chip ice cream for my Mimi. She’s tried this recipe and prefers it with larger chunks of cherries throughout, but I’ve made it here with fewer cherry bits and the added crunch of dark chocolate. If you’re really into cherry flavors, you can add more cherries or a little cherry liquor for good measure. 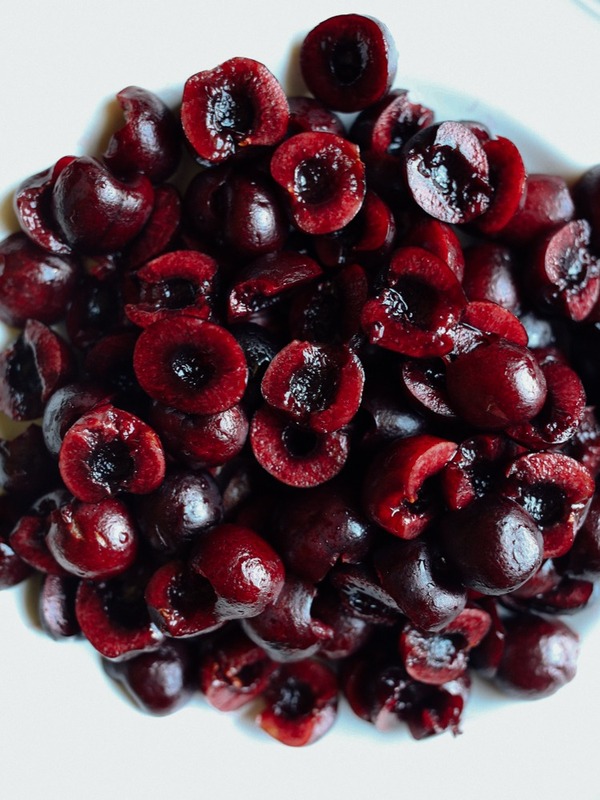 First, we roast dark cherries in the oven with sugar and salt until they’re soft, sweet, and syrupy. Roasting makes everything feel a little more sophisticated, right? Then, we purée a portion of the cherries to mix in with our vanilla ice cream base, and leave the remainder of the cherries in halves or quarters so that each bite of ice cream contains juicy fruit goodness. 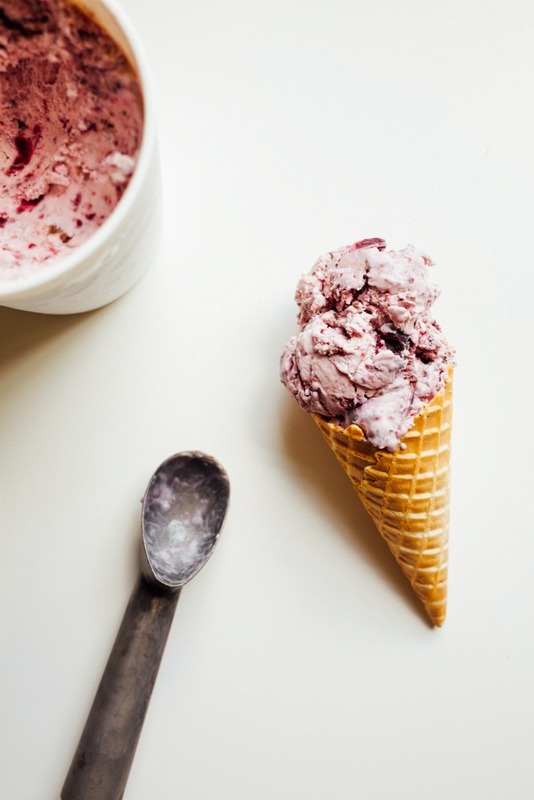 If you want a smooth ice cream without any tiny bits, be sure to strain your cherry puree prior to adding it to the cream mixture. Sidenote: This will also save you the embarrassment of getting cherry skins stuck in your teeth. Add a little chocolate to your cream and wham, bam, thank ya ma’am, your ice cream is ready for the freezer. 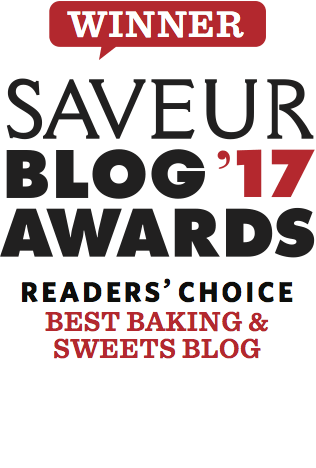 If you’ve made any of my no churn ice creams in the past, you know that they are quite easy and come together with very few ingredients or kitchen equipment. This recipe is no exception. Besides the roasting of the cherries and time spent in the freezer, this recipe can be whipped up in less than ten minutes! This means that you get to spend less time in the kitchen and more time loving on someone important to you (Read: snuggling your man friend or planning your pending nuptials to Harry Styles). Happy Monday to you all! If you try out this recipe, let me know what you think about it in the comments section below! 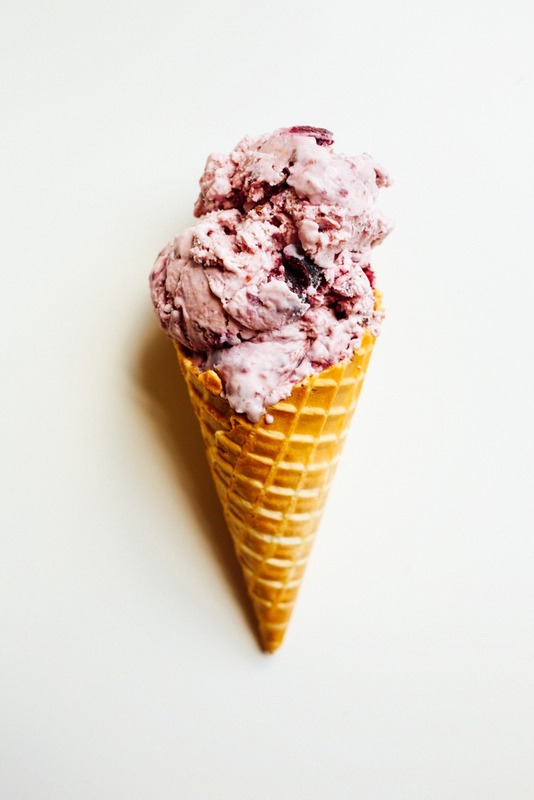 No churn cherry chip ice cream is a combination of sweet, roasted cherries, chocolate chunks, and a creamy no churn ice cream base that is flavored with high quality bourbon. Preheat the oven to 400 degrees. Chop cherries into halves and toss in a pyrex dish with sugar and salt. Roast in the preheated oven for 25 minutes, tossing occasionally. Once finished, allow to cool to room temperature. You can expedite this process by placing the cherries and their syrup in the fridge. 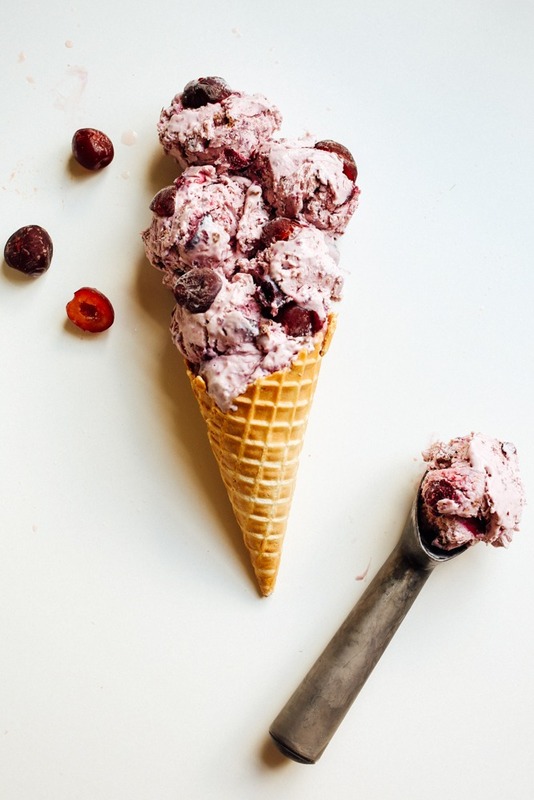 Once ready to prepare the ice cream, remove 1/2 cup of the roasted cherries and place the remaining cherries and syrup into a food processor or blender to puree. Set aside. In the bowl of a stand mixer, whip cream to stiff peaks. 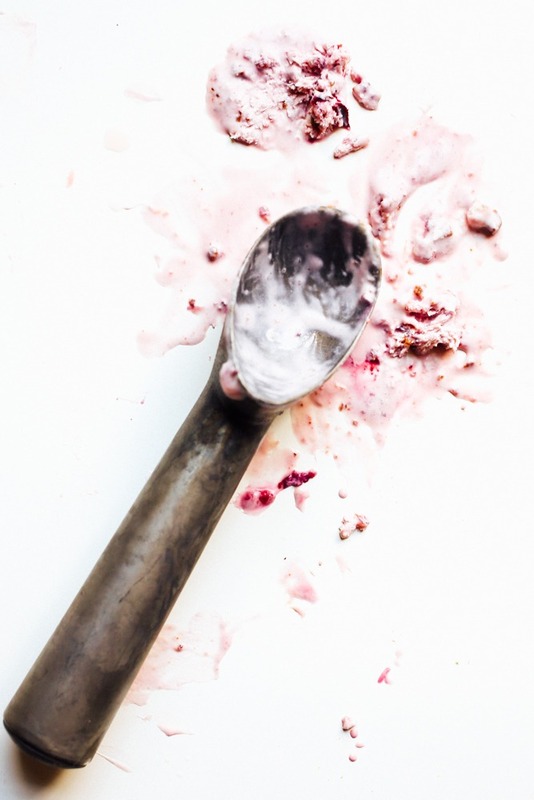 In a separate large bowl, stir together the sweetened condensed milk, cherry puree, and bourbon. Fold the whipped cream into the milk mixture. Fold in the remaining chopped cherries and chocolate. Spread the mixture into two loaf pans or into one larger, freezer-safe dish. Place in freezer for 6 hours or until frozen. For a smooth ice cream, puree all of the cherries and strain using a fine mesh strainer prior to adding to the milk and whipped cream. oh hooray! I sure hope you try it! 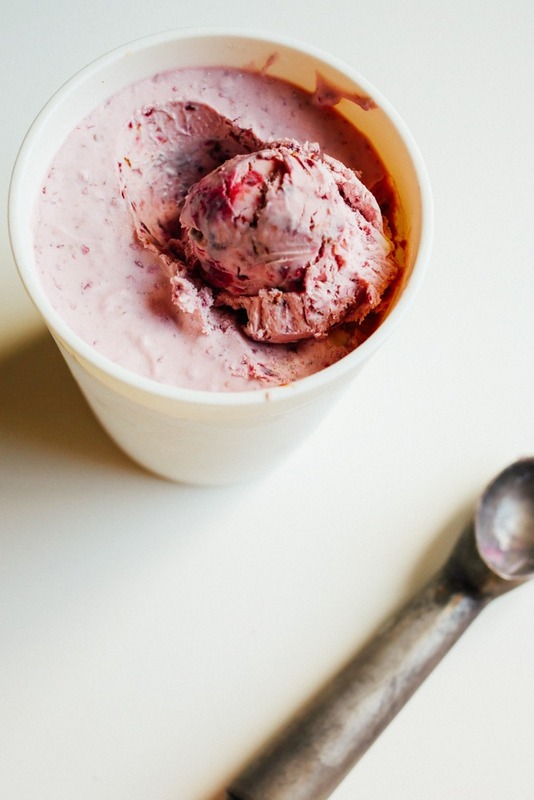 Some of the most gorgeous ice cream photography I’ve seen in a long time. bless you! thank you for the compliment! I LOVE that ya’ll went to Mexico so soon after having George. Also, thank you for drinking all of margaritas. I was living vicariously through you. I hope that you’re drinking a marg. You’ve earned it. I didn’t leave Aimee until she was about 16 weeks. I was crawling up the walls to get out of the house this time around. Thank goodness for grandmas!